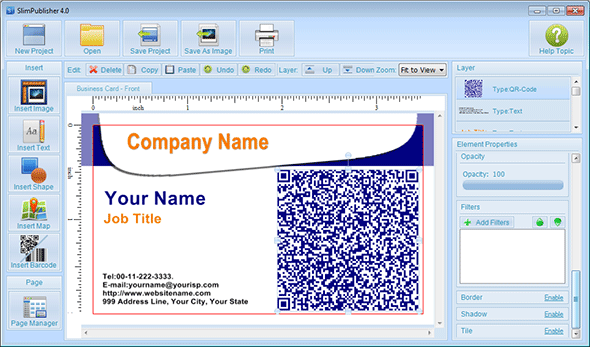 Instantly create business cards, letterheads, flyers, postcards, labels, artistic QR codes and other artworks that make everlasting impression. SlimPublisher is professional, but affordable software that makes desktop publishing easy and intuitive. The simple user interface and the flexible collection of tools allow even novice to master the whole process without any serious efforts. SlimPublisher will give you a flexibility to generate your own design or choose one of the many ready-made matching designs, customize it with your information, and print it within just a few minutes without any serious hassles. Output can be sent directly to printer (350 DPI resolution) or saved in one of the seven common graphics formats, .png, .bmp, .emf, .wmf, .gif,.jpeg, .tiff, exit (Full bleed, Trim, or Both) for offsite printing. You have a full control of your design or template you use. You can delete any object, align, move or resize it, and transfer it up and down from different layers. Support for undo, redo, copy and paste is available. Insert any text into your design and define font, size, color, style and alignment. Drop the text frame anywhere in your design and move it or resize it with your mouse. Insert high resolution graphics or one of the 15 vector based shapes into your design. Resize, move, rotate, change the order of the layers, apply image effect filter or set border / frame. Define color and opacity of your shape before you insert it in the project. Use built-in integration with Google Maps to insert the map of your location on your letterhead or business card. Create an artistic QR code (2D barcode) and easily import contact and address into your mobile device, or download software or visit web site simple by scanning the code. Print code 39,UPC-A, EAN-13 and EAN-8. Use Page Manager to review and delete any pages or add new one to your project. Support for 47 varieties of business card papers from Avery and PrintWorks make printing on own printer easy. Added saturation image filter and noise image effect, improved memory management when working with large images, updated manual / help and fixed the issue with resizing / importing large sized images.